Must be the understatement of the year. I come by my appreciation for printed books honestly. My mom is a reader, both my grandmas were readers, and one of them had a habit of giving me books as gifts. I have passed my fondness for books onto my children. All of them enjoy visiting bookstores and when we were in Portland visiting my brother years and years ago, our favorite place, the place we had to visit more than once, was Powell’s. For Christmas this year, we got books for our three children, who are now all grown, with one married to a book lover and another engaged to a book lover. We shared the books on Christmas Eve. They also got chocolate and blankets. Hubby told me after we had wrapped the gifts that we were inadvertently celebrating an Icelandic holiday, Jolabokaflod, which translates as the Christmas Book Flood. I had no idea I was Icelandic! This is a holiday tradition I can (and will!) keep. Almost all the kids were home on Christmas Eve (with the exception of Eldest Son’s fiance, who has been studying in England) and we went to a Chinese restaurant for supper, a tradition we have had for the past 14 years, and then came home to open gifts. Afterwards, we chatted. 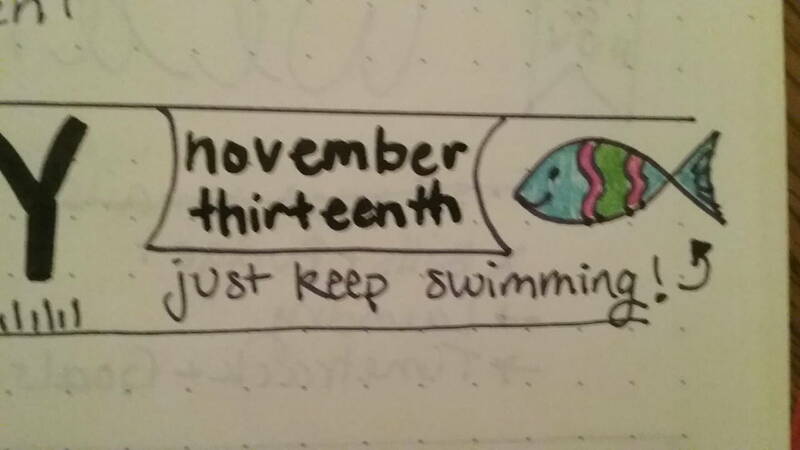 During our conversation, Daughter told me about Bullet Journals and showed me the one she has started. A Bullet Journal is a cross between a journal and a to-do list, with an index kept at the front (an excellent idea) and bullet points that correspond to various types of tasks on your to-do list. Daughter is making hers super artistic. It’s so striking that I wanted to keep turning the pages just to admire the layout and her flare for lettering. Daughter has never felt particularly artistic in our artsy family, but I’ve always seen it in her. She just had to find an outlet that worked with her more structured style. The Bullet Journal seems to fit that style. 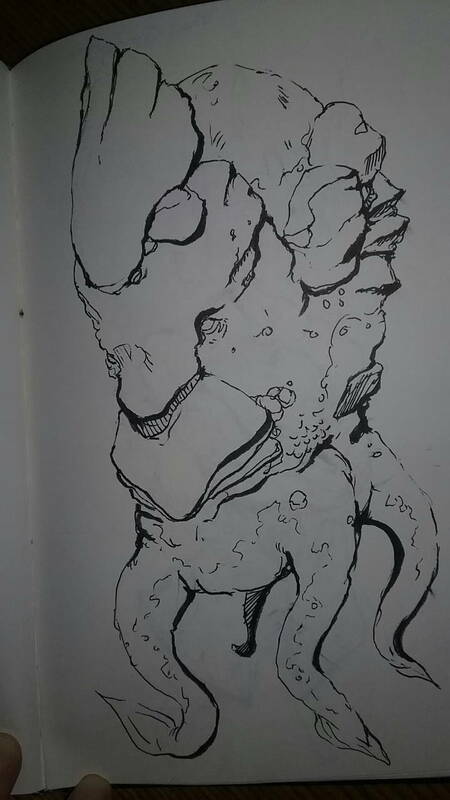 Here are a few illustrations from her journal. Because her book has so much writing in it, I didn’t want to breach her privacy by taking more photos. Olivia S., Bullet Journal, Halloween, 2016. 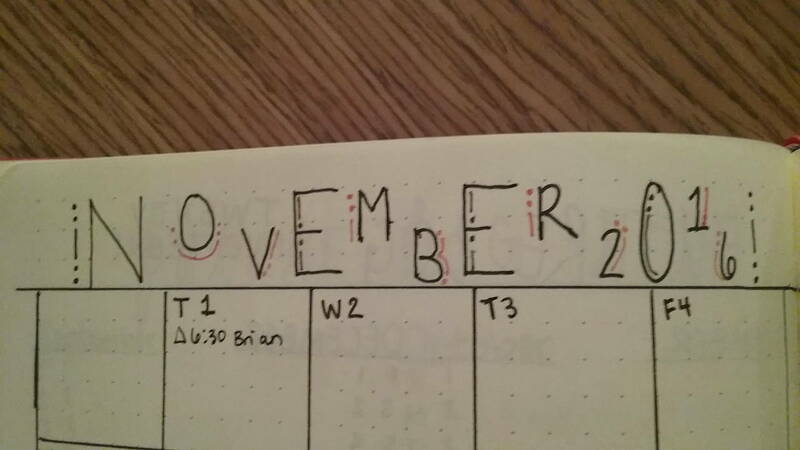 Olivia S., Bullet Journal, November 2016. 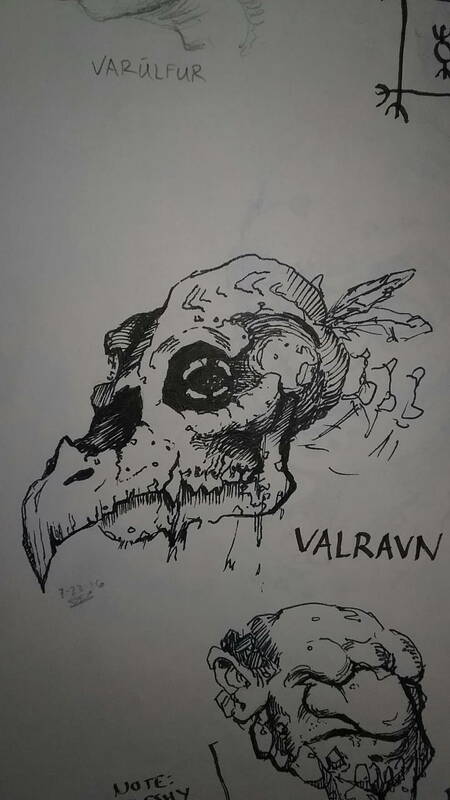 Ian Warner, Valravn sketch, 2016. 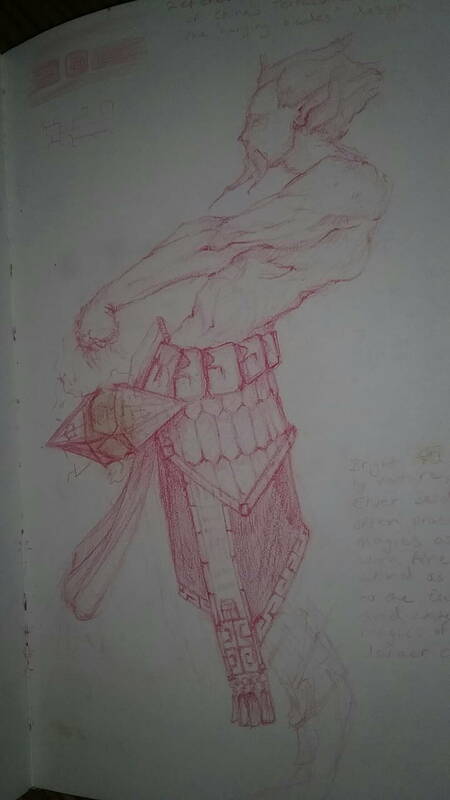 Ian Warner, armor sketch, 2016. 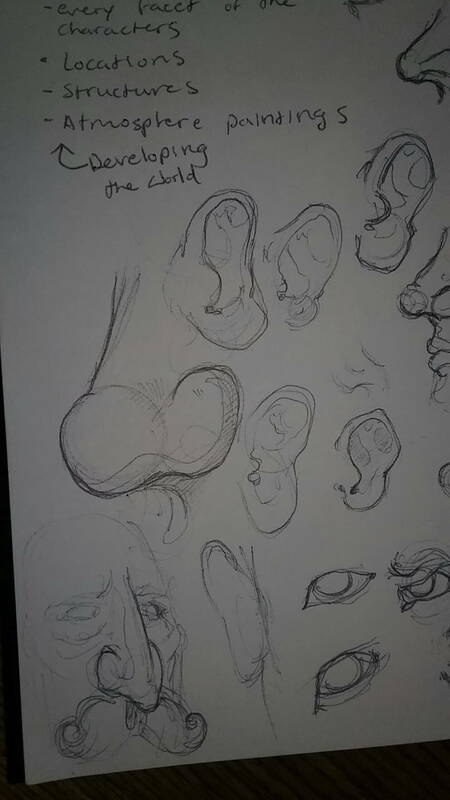 Ian Warner, noses, ears & eyes, 2016. 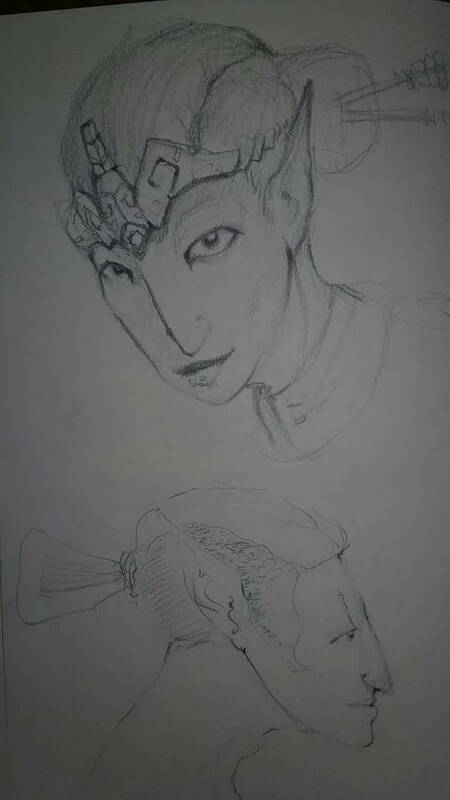 As you can see in comparing Daughter’s and Eldest Son’s work, each has their own unmistakable style. Their personalities come right through their work. It’s one of the things I find most fascinating about art. What’s even more thrilling is seeing that my love of all things book, including the art of making books, has carried on in my children. Conscientious Dog Owners, Bah! Humbug! Have You Ever Just Craved a Hot Dog?